Ashness Self-cateringA pretty mews cottage, quietly located in a little access lane a short stroll from the village centre, in the Kirkstone Foot area of the village - only a couple of minutes walk down Peggy Hill to the centre with its excellent shops and places to eat. Whatever season of the year you choose there is very little need to use the car on a daily basis - the area abounds in fine walking for the adventurous and not-so-adventurous visitor with walks from the door to both Wansfell and The Fairfield Horseshoe. Don't miss a lake cruise on Windermere, England's largest lake, whilst for more active members of the family mountain bikes can be hired locally and there are tennis courts in the village centre. Ambleside also has bowls, mini-golf and two cinemas in the village. Accommodation: Front door entrance into small hallway with hanging space for your outdoor gear. Attractive open plan living/dining room has integral kitchen at one end. This sociable arrangement of the living area is ideal for holiday use - no feeling of being 'on your own' in the kitchen as you can join in with the rest of the family whilst cooking (TV, DVD, free wi-fi broadband, video, CD/tape player). Upstairs there are two bedrooms - one double bedded and one twin - and a good bathroom with bath, shower over, basin and wc. 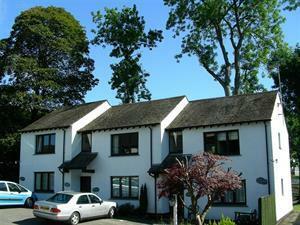 The cottage is comfortably furnished and well equipped for holiday use with fitted carpets throughout. A light and sunny aspect make for a very pleasant holiday feel and cosy in the coldest seasons. Ashness offers weekly bookings starting on Saturday.